Geno Crandall played on three state championship teams at DeLaSalle High in Minneapolis, but he received just two Division I offers and a couple from D-II schools. Four years later, Crandall went from under-the-radar recruit to one of the top grad transfers of the offseason. He heard from dozens of programs, including Minnesota, where he used to watch games as a kid. Crandall narrowed his finalists to Minnesota, Gonzaga and Xavier. GU coach Mark Few and assistant Brian Michaelson called soon after Crandall received his release and so did Xavier assistant Ben Johnson, a former DeLaSalle player and Minnesota assistant. “Going from that (four years ago) to where it’s at now is pretty crazy,” Crandall said. Crandall decided to leave Minneapolis with the long-range goal of coming back when his hometown hosts the 2019 Final Four. The hometown pull was strong, as was Johnson’s pitch from the Big East power, but Gonzaga landed the former North Dakota standout. “I grew up a 5-minute drive from campus and being a Gophers fan,” Crandall said. “It was extremely tough for me, knowing they have a talented team this year. But you have to do what’s best for you personally sometimes. Crandall said he’s grateful for the support he’s received from his hometown, the Gophers and Xavier after announcing his decision Thursday. Crandall estimated that he played with “five or six” DeLaSalle teammates that went D-I, including Reid Travis, who recently left Stanford to join Kentucky as a grad transfer. Crandall blossomed at North Dakota, moving into the starting lineup early in his redshirt freshman season. As a sophomore he led the Fighting Hawks to the program’s first NCAA Tournament and followed that up as a junior with career-best numbers (16.6 points, 4.3 rebounds, 41.7-percent 3-point accuracy, 67 steals). He torched Gonzaga for 28 points as UND’s upset bid fell just short last December. Crandall gives Gonzaga versatility in the backcourt as a scorer, ball-handler, penetrator, shooter and defender. He visited during Hoopfest and said it was “really cool” to witness the attention and support Zags players receive in the community. 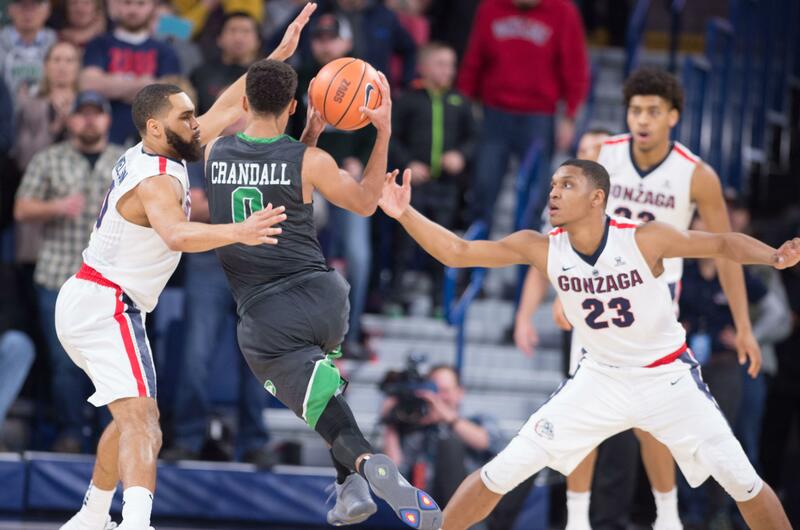 Crandall did his homework, getting a feel for Gonzaga’s system and how it meshed with his ability to operate off ball screens and thrive in a two point-guard alignment. He also consulted former North Dakota teammate Drick Bernstine, who finished his career at Washington State. In the end, Crandall felt Gonzaga provides the best chance of reaching the Final Four and preparing him for a professional career. Published: July 6, 2018, 5:47 p.m. Updated: July 6, 2018, 8:54 p.m.